Lemon GreenTea: Ovation Productions proudly presents DEBBY BOONE SINGS KAREN CARPENTER! 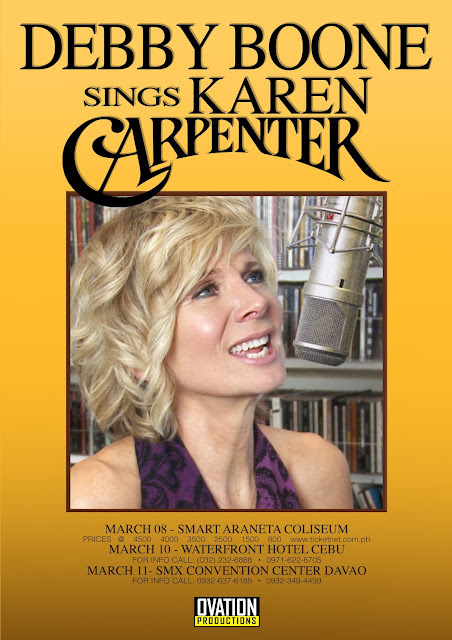 Ovation Productions proudly presents DEBBY BOONE SINGS KAREN CARPENTER! The singer behind one of the top-selling pop hits of the 1970s pays tribute to an iconic singer and her music when Debby Boone performs the greatest hits of Karen Carpenter during a major concert on March 8 at the Smart Araneta Coliseum in Cubao, Quezon City. The presentation from Ovation Productions will kick off the three-night, three-city local tour of the acclaimed American singer, actress and author that also includes shows on March 10 at the Cebu Waterfront Hotel in Cebu City and on March 11 at the SMX Convention Center in Lanang, Davao City. Dubbed “Debby Boone Sings Karen Carpenter,” the concert series marks the local debut of Debby as she extols the musical achievements and legacy of the late Karen Carpenter, one-half of the ‘70s pop duo, The Carpenters, who, with her brother Richard, made up one of the era’s biggest and most successful soft rock groups. Touted as the ultimate Karen Carpenters tribute act, the show is expected to evoke happy and wonderful memories of the magical sound and spectacle of a Carpenters live performance featuring Karen on the drums and lead vocals in her typical contralto vocal range and Richard on the piano with back-up vocals. Debby brings with her on her first foray in singing Karen Carpenter the superb vocal quality and style that have produced numerous hit records and sold-out tours during a brilliant and successful musical and entertainment career spanning nearly 50 years. While there were past tributes to Karen Carpenter by other artists, they were less than impressive and didn’t have the kind of skills, style and appeal in coming out with the familiar soft rock sound and carefully crafted songs associated with The Carpenters and that have captivated millions worldwide. Among the Carpenters hits Debby is expected to sing are “(They Long To Be) Close To You,” “We’ve Only Just Begun,” “Rainy Days and Mondays,” “Top Of The World,” “Superstar,” “:Hurting Each Other,” “I Need To Be In Love,” “For All We Know” and many more. She will also perform her best-selling song the mega-hit “You Light Up My Life”. Debby’s career as a singer, artist and actress traces its roots to a life full of music as she was growing up in New Jersey with her family led by her father, Pat Boone, the popular singer of the 1950s. At the age of 14, she began touring with her three sisters and her father, with whom she earlier recorded as the Pat Boone Family and later as The Boones or The Boone Girls. She launched a solo career with the release of her debut solo album, “You Light Up My Light” (1977), which became the biggest hit of the 1970s, spending 10 consecutive weeks at No. 1 on the Billboard Hot 100 chart – longer than any other song in Hot 100 history until that point. “You Light Up My Life” earned Debby a Grammy Award for Best New Artist and an American Music Award for Favorite Pop Single of 1977. She also received Grammy nominations for Best Pop Vocal Performance-Female and Record of the Year. The song likewise succeeded on Billboard Adult Contemporary (No. 1 for one week) and Country (No. 4) singles charts. The single and the album of the same title were both certified platinums. Debby’s overnight success led to a tour with her father and frequent appearances on major television shows. In the 1980s, she recorded Christian music which garnered her four Top 10 contemporary Christian albums, as well as two GMA (Gospel Music Association of the United States) Dove Awards and two more Grammys, including the winning “With My Song” (1980). As a musical theatre actress, Debby toured the United States during 1981-82 in a production of the stage adaptation of the film, “Seven Brides for Seven Brothers,” which was a commercial and critical success nationwide before opening on Broadway in July 1982.